Posted: Sun 25 Jan, 2004 9:04 pm Post subject: Contest: Get a Free Oakeshott Book in Hand! Get a Free Oakeshott Book in Hand! myArmoury.com, in conjunction with Arms & Armor, is giving away a free copy of Sword in Hand by Ewart Oakeshott to THREE lucky myArmoury.com members! Description: Reading this book is like spending an evening with the world's foremost expert on the medieval sword and discussing his favorite subject. 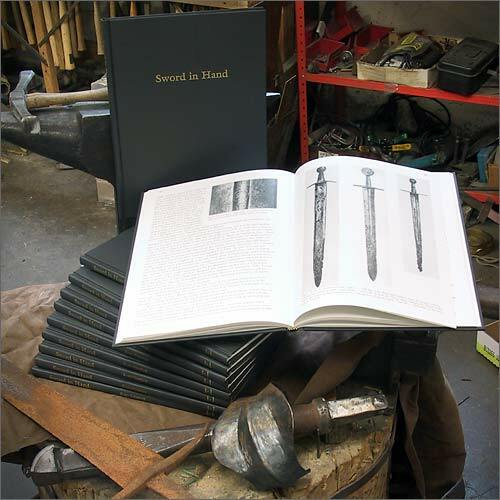 Mr. Oakeshott has rewritten a collection of articles, adding additional chapters and illustrations, describing the development of the medieval sword in its historical context. This concise overview of the development of the European sword is enhanced with the unique insight of the author and gritty anecdotal examples that bring life to these historical subjects. The work is heavily illustrated with the author's unparalleled collection of photos and illustrations presented in a large format. This gives the student of the sword detail often left out of other volumes on the topic. An excellent addition to any library of the medieval period and a must for the student of the sword, these 147 pages with 126 illustrations are something not to be missed. This book is typically available only through Arms & Armor and has a value of $60 US. Please note: this contest is over. The winners have already been announced. You must be joined prior to Monday, February 16th, 2004. All participants will be entered into a drawing and three winning names will be randomly selected. The winners will be announced that same Monday. We at myArmoury.com want to thank the gracious generosity of Arms & Armor of Minnesota for their contribution of this contest's prize. I have wanted that book for quite a while but never go around to buying it. For those of you that are curious, you can read a review of the Sword in Hand book HERE. Read a couple of his books--good stuff. In addition to the copy of the book that Arms & Armor has donated to the contest, they've just agreed to sell me two additional copies at wholesale to add to the contest prizes. They're also volunteering to take care of shipping duties and charges, too! So that means we'll be giving away THREE copies of Oakeshott's Sword in Hand book! This is a direct example of the money spent on enhanced memberships going right back to the site and in the hands of our members. Thanks goes out to Arms & Armor and to those members who have enhanced their memberships! Only one more week left for this contest. The three winners will be chosen on Monday, Feb 16th!